Cross the big blue Johnson St. bridge from downtown Victoria and you’ll enter the municipality of Esquimalt (inc. 1912). This community, bounded on three sides by water, claims a population of 20,000 (2009). The name comes from the native Es-whoy-malth, which means “the place of shoaling waters”. Coast Salish people lived on Esquimalt Harbour long before any Europeans arrived. The first European to enter Esquimalt Harbour was a Spanish explorer named Don Manuel Quimper, who named his discovery Puerto de Cordova. The British Royal Navy gained control of the harbour and operated here from 1837 to 1905. The Hudson’s Bay Company played a part in the development of Esquimalt too; when Chief Factor James Douglas visited in 1843 he decided to establish three farms to supply Victoria and other HBC forts in the Pacific Northwest. Viewfield, Craigflower and Constance Cove farms were eventually abandoned, but Craigflower farmhouse and schoolhouse still exist as heritage sites. 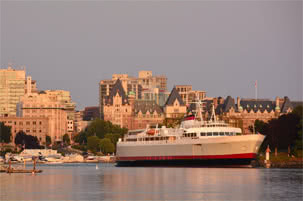 The gold rush in 1858 was pivotal to bringing the first population boom to Esquimalt, as many who landed at Esquimalt Harbour decided to stay and settle. As this boom subsided the community found its identity defined by military life and shipbuilding. Today Esquimalt Harbour is home to Canada’s Pacific Naval Fleet at CFB Esquimalt, and the Graving Dock, the largest non-military site for ship building and repair on the west coast. CFB Esquimalt is Canada’s west coast naval base and it supports the Joint Task Force Pacific Commander and the warships of the Canadian Pacific Fleet. Approximately 4200 military and 2000 civilian personnel are employed on its 10,300 acre site. As the largest employer in Esquimalt, the contribution of the naval base to the local economy is unsurpassed in the community. Located in sheltered Skinner’s Cove, the Esquimalt Graving Dock officially opened on July 1, 1927, after six years of construction. The EGD, though owned and operated federally, is available to any company or individual on a first cone, first serve basis, with all work being carried out by private sector ship repair firms. 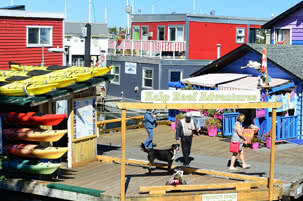 Esquimalt because of the well established infrastructure and amenities, and friendly seaside atmosphere. Housing in Esquimalt ranges from apartments and condos, townhomes, multifamily and single family residences. 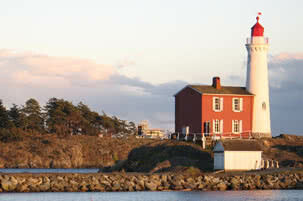 The main neighborhoods of Gorge Vale, Old Esquimalt, Saxe Point Kinsmen Park and Rockheights offer reasonably priced housing, in keeping with the demand for housing options suitable for the military and their families, as well as higher end properties, including waterfront and waterview homes. Esquimalt Recreation Centre – featuring a 25 metre pool and multi-purpose building. Esquimalt continues to be defined by its military and shipbuilding history, because of the influence of CFB Esquimalt and the Graving Dock, but is also experiencing changes. Because of the lovely climate and seaside atmosphere, the community is becoming popular with people who are living in Victoria, yet still desire the intimacy and character of a small town.